I have two letters of yours to answer. I realize it has been longer than usual since my last letter. I have the emergency room duty today, so I will try to write a long letter. The biggest problem in our family right now has to do with a kitten. I will tell this story first so I can forget about it and go on with other news. We wanted the kids to have a pet since we both grew up with pets. On Tuesday afternoon Jeannie got a 6-week-old, half-Siamese kitten that was very pretty. The kids were really crazy about it. We were keeping it in the house until it got a little bigger. Yesterday morning about 8:15, the kids were trying to get it out from under the recliner and somehow smashed it (broke its neck) and killed it under the chair. Well, that was quite a shocking blow. Neither Angelique nor Steven cried about it. They both acted very strange yesterday and in different ways. They realize that they were somehow responsible for it. It is still hard for me to believe it happened, and after only 2 1/2 days. Anyway, you will see the cat on the beginning of the next video tape we send. I started it the day the cat was brought home. Now we are at a loss about what to do about a pet. Angelique doesn't want anything that is a baby. Have you ever in your life heard of such a story? You will find enclosed the papers and envelope that you need to mail to the postal service. Since you have the receipt for the insurance on the package, you need to staple it to the papers and mail it. We had a very good time in Athens. It was impossible to spend all the money we took. Things were just too cheap. We had all kinds of problems going to Athens, all the way from Rome till we got to sleep at the hotel. After that, the only problem was the weather. We really enjoyed the lectureship. All the speakers were good. The kids had classes while we went to lectures. They had a good time, too. Our hotel bill for 6 nights, which included all but 2 meals, was less than $300. The Greeks are so much like the Italians. They even look a lot alike. We kept trying to speak Italian everywhere. Fortunately, everywhere we went, they spoke English. We really wore ourselves out. We got up early every day and went to bed late. Even the kids didn't get enough sleep. One day Steven was a mess all day long from being so tired. Everyone went by chartered bus to Corinth on Thursday of the lectureship. It poured down rain all day and was terrible for seeing ruins. We didn't get much out of the ruins at Corinth except cold & wet. Steven slept nearly every minute on the bus going and coming. He sure felt a lot better after he did, too. Above is the stone before the judgement seat in Corinth to which it is believed that Sosthenes, of Acts 18:17, was chained and beaten. The hotel was 20 miles outside of Athens. It was in the country on the beach. We would have felt very isolated there. We got to be good friends with a couple who live in Athens, Dave & Debbie Shepherd. He is in the Air Force. Jeannie dated him at college. They have 2 kids, ages 7 and 5. Angelique got to be really good friends with the 5-year-old girl. They showed us around. They have a big American station wagon that we all fit into very well. Friday was our one free day in Athens. The weather was beautiful that day. It was warm & sunny. We needed that weather the day before in Corinth. Friday night we stayed with the Shepherds. They took us shopping to a lot of places and we had our suitcases packed tight coming back. Nothing got broken. Several of the things we got are shown on the videotape. The Greek food is very good. It is unbelievably cheap. The 8 of us went out to eat Friday night. We ate all we could hold and the bill was only $13.50. Wow! Jeannie got a good Greek cookbook on the Air Force base. Jeannie got a 3rd century B.C. Greek coin from the director of the lectureship. He had found it himself. He had a handful of Greek coins. Jeannie got it for my birthday, but he wouldn't let her pay him anything. I need to write him and ask him where he found it. 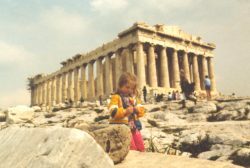 I could write a book about all we learned, did, heard, and saw in Greece. Ask me questions. We have been real busy at work getting ready for the IG (Inspector General). He will be at Pinetamare for only 45 minutes on this Wednesday. We couldn't believe we've worked so hard and only get 45 minutes. The IG is an admiral from Washington. His team has already been here for a week at the hospital. He comes Monday. The hospital has been repainted from inside and out. It looks a lot better. I hope the IG finds all the problems here & helps us out. It seems to me that they are trying to hide all the problems from him. We thought the young engaged couple, who was baptized in our bathtub, were getting married on the day we went to Athens. They were going to housesit for us. They didn't get married, so just the girl stayed at our house. They were really disappointed. We were glad someone stayed in our house. It was real neat & clean when we got back. I guess she'll be a good housewife. They are getting married next Saturday. The girls at church are giving them a shower tomorrow afternoon. Will you find a book for me please? I really need it and as soon as possible. I don't know what it costs-just let me know. It is Traits of a Healthy Family, by Dolores CURRAN. Try the Christian bookstore at the mall. They might have it if no one else does. If you can't find it in Harrison, please ask someone to order it. If you still can't find it, please let me know. It was very highly spoken of by Royce Money, one of the speakers at the lectureship. I have his address and could write him if you can't find it. It sounded like something every family physician should read. I need the book to prepare a lecture of my own. Jeannie and the kids just came by & brought some cupcakes. We all ate one. (There were 4.) The kids are acting normal again. Jeannie is almost back to normal. Jeannie bought the kids a swing set today. She had to put it on lay-away because she couldn't get it home. I will go in on Tuesday afternoon & put it on my luggage rack & take it home. I'm sure it will take the rest of the afternoon to put it together. We were surprised they got swing sets in. Several weeks ago they told Jeannie there were none coming until next Christmas. That will keep the kids busy this summer. I hope no one breaks an arm. Swing sets tend to rust really bad over here. Any suggestions? Where I am sitting I can see lots of steam coming out of Solfatara. It just stopped raining. I wish I could see all your slides you took on your trip to Europe. Who all have you shown them to now? Diane sent us the 8-hour miniseries of George Washington that we are watching now (without commercials). It is really good. Did you all see it? I had to do a big report on Washington in Mr. Van Deven's class in high school. They still haven't paved our street yet. There was a real strong earth tremor just a minute ago. When I worked here all the time, they didn't bother me so much. There was no major damage here from this quake. I hope there is an earthquake while the IG is here. The weather has been really nice since we got back. It has been sunny & warm most of the time. The house has been staying in the 60's. We just had another small tremor. This building is surely going to shake down one of these days. Jeannie is having fun in her Italian class. Yesterday they went to the Vomero half the day to shop. She finally found some yellow curtains for Angelique's room. The class normally meets at the receiver site at Lago Patria. Remember where all the towers and the satellite dish are? What airline did you fly on out of London? A good part of Daddy's problem WAS jet lag. Don't sleep when it isn't time to sleep! Another part of the problem was culture shock. It kept getting worse & worse because he was tired, nervous & not sleeping right. But, you're coming back, right? They gave me a birthday cake at work on Monday. Most of it I took home & we are still eating on it. It was made by the same girl who made Angelique & Steven's birthday cakes. She is one of my patients. The clinic is keeping her in the cake business. I will let you know when my package gets here. It is best for you to call on Saturday or Sunday; any time of the day will be fine. If you want to call at midnight (Arkansas time) on Friday night, that would be fine, too. I am not off on Thursday afternoon. (When you were here I skipped what I was supposed to be doing that afternoon.) I am usually off on Tuesday afternoon. No matter when you call, there is no guarantee that I will be home or that the kids will be awake. Never call between 5 and 6 pm here on Sunday nights, because of tapes. Last Sunday night we got to watch a videotape sermon. That was interesting & a first for the church in Naples. We have 3 more videotape sermons. Are you taping some cartoons for the kids? I got a letter from Becky this week. Have they sold their house? I'm sure they miss Andy. Are you all going to the World's Fair? Is Becky going to spend some time with you in Harrison? Why were you trying to call us on Easter Sunday when you knew we were in Athens? The kids got to look for Easter eggs on Saturday morning before we left for Rome. Our landlord brought us an Easter cake. It would have been really good if we liked alcohol. It wasn't as strong as the cake we ate at their house on New Year's day. We brought back a Greek vase for the landlord's family. Angelique, Jeannie, & Steven wore their new Easter clothes to church on the Sunday before Easter. They have Easter in Greece, usually on a different day than the rest of the world. This year, however, both fell on the same day. Our taxi drove by a lot of churches having midnight mass on our way to the hotel. It was quite a spectacle. They shoot fireworks in Greece at Easter. It is their biggest holiday. We had planned to go to downtown Athens on Sunday morning to a big market. We got to bed so late & were so tired that we didn't get out of bed till about 10:30 that morning. Even the kids slept that late. We weren't sure the market would be open on Easter, anyway. I had been at the hospital all night the night before we went to Athens & only had gotten about 4 hours sleep. I was tired the whole time we were in Athens. Pompeii is not mentioned in the Bible. Pozzuoli is. It was called Puteoli during the Roman Empire (Acts 28:13). I personally don't think Pompeii's destruction was linked with Jerusalem. I said that the Jews, living in the Roman Empire at the time of Pompeii's destruction, were sure that it happened because Rome had destroyed Jerusalem. I agree that you should fly straight home from here. Don't go back to Rome. You've already been there. If you want to go to Switzerland, Venice, & Athens, may I suggest the following? Fly into Switzerland, then take the train. Go to Venice for 24 hrs. Ride the train to Athens. Stay downtown for 2 days. Take the overnight ferry to Brindisi, Italy. Take a train for about 4 hours to Naples. Bring June & Billy Joe with you. Everyone going to the Holy Lands flies out of Athens. Take 3 weeks off. If you are going to spend that much money, stay as long as you can. Here we could take you to Paestum & see the Greek temples. They are more impressive than those in Athens. We could also go to the Capodimonte museum, one of the palaces, and to Herculaneum (like Pompeii, but smaller & better preserved). When do you plan to come? Put in your order early. We plan to travel a lot next year. Let Daddy stay a week & you can stay a month if you want. Pamela is moving to a good location for you visiting Becky. When they get settled in Nashville, would you send me their address please? You should be able to drive to Searcy, spend the night, then drive all the way to Asheville the next day. Jeannie's parents would love to have you. That is, if they ever get their house built. Jeannie's mother is going crazy in that tiny apartment. Paestum is about 20-30 minutes south of Vietri where you got your plate that broke. We needed a paper cutter to cut our photos so they will fit into our albums. They are bigger than the American 3 1/2 X 5. John & Faye were without water for 5 or 6 days. They stopped talking about moving after it was fixed. Did I tell you that two stupid Italians cut down a tree & broke the telephone wire? We were without a phone for a couple of days. I was surprised it got fixed so soon. I don't think there was anyone but me at the lectureship who was in the Navy. There were 201 people there. It started at 6:30 pm on Sunday. We had lectures from 8:30 am to 12:30 pm and from 6:30 to 8:30 or later every night. We ate afterwards. Monday & Tuesday afternoons were free. Monday afternoon Dave & Debbie took us to the temple of Poseidon at Cape Sounion & drove back through the countryside. Sounion was about 10 miles east of our hotel in the opposite direction from Athens. Tuesday afternoon they took us to a Greek restaurant in Glyfada (where the Airbase is located), then to the train station & we went to the Plaka (downtown Athens) where hundreds of shops selling all sorts of things, cheap, are located. Wednesday afternoon we went to the Acropolis (a tour arranged by the lectureship). We had a sermon on Mars Hill and were told that Paul may not have been on this hill but simply before the Areopagus council which probably met somewhere else. It was warm enough part of the afternoon Wednesday to wear short sleeves. I carried Steven on my back most everywhere. I will be staying at Pinetamare Clinic the rest of the time I am in Naples. We probably won't have a new doctor for a few months. Penelope is returning to the States next week. She has already worked her last day here. Her party went just fine. There were not but half as many people there as we expected, but we still had a good time. Monday, the first day back from Athens, I was the only one seeing patients at the clinic. Everyone else was doing something else, somewhere else. It is difficult to see all the patients when we have gotten used to having 4 practitioners. I saw 38 patients, the most I have ever seen in one day. If we go to Memphis, we may want a calf in 1986. Keep it in mind. It depends on how cheap beef is in the commissary there. This letter has gotten too long to proofread. Ignore any mistakes. I hope I didn't repeat myself anywhere. I have about 1/2 of a videotape done & will send it when I figure out what to put on the last 1/2.